Whether new application development or migrating legacy, every development shop and IT organization needs to monitor their applications in the cloud, the same as they do on premises. Azure Diagnostics has some capabilities, but what I constantly hear from users is that it’s either (a) not enough, or (b) too cumbersome to set up. Optional? Of course I want to see it. Conveniently, Microsoft recommends 3 tools to do this with. Un-conveniently, none of these are web based and they all just give you access to raw data, and very little charting or real-time intelligence. Just….. data. Nevermind that one product seems to have gotten stale since a recent acquisition, and doesn’t even have screenshots! So, let’s summarize: lots of diagnostics data is available, but think realistically. Think Dev Ops. What happens when you are in the middle of a major production performance issue and you don’t have the diagnostics you need? You are redeploying an application (and thankfully you have a great branching strategy, so you feel perfectly safe just willy-nilly launching code into prod, don’t you?) to get data, then shipping it to storage, and then digging through that data to find a needle in a haystack. Would you like to be able to troubleshoot a performance issue in the middle of the night, or on a weekend, from your iPad or home computer’s web browser? Forget it: the best you get is this spark line in the Azure portal. If it’s real pointy, you probably have an issue; but since there is no alert based on a threshold your customers have likely already let you know. And high CPU, Memory, I/O, or Network doesn’t tell you anything about where the problem is. Stackify supports application and server monitoring in real time, all through a great web interface. 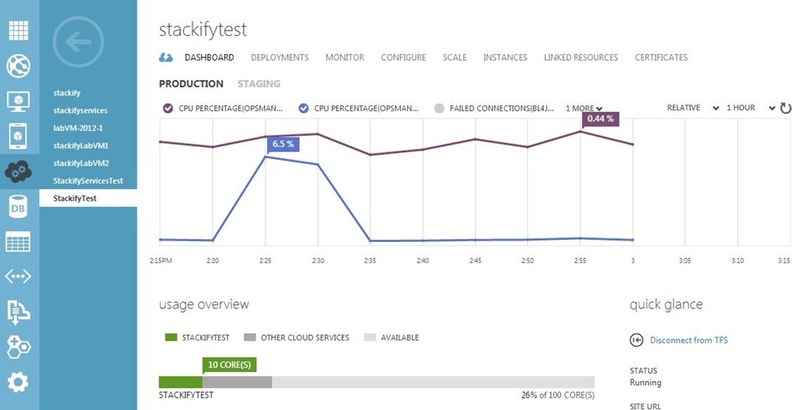 All of the things that Azure Diagnostics provides, Stackify provides for your on-premises deployments, and you don’t need to know ahead of time that you’ll need it. It’s always there, it’s always on. 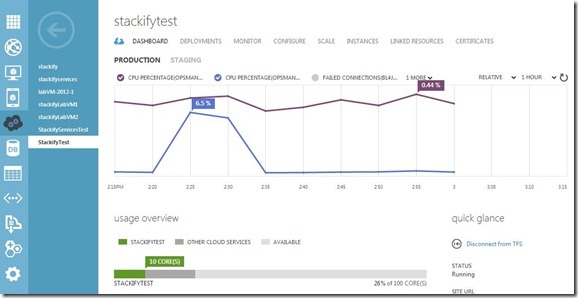 Azure deployments are essentially no different than on-premises. It’s a Windows Server (or Linux) in the cloud. It’s behind a different firewall than your corporate servers. That’s it. Stackify can provide the same powerful tools to your Azure deployments in two simple steps. Add a startup task to your web or worker role and deploy. If you can’t deploy and need it right now, no worries! Remote Desktop to the Azure instance and you can execute a Powershell script to download / install Stackify. Log in to your account at www.stackify.com and begin monitoring as much as you want, as often as you want and see the results instantly. Event Viewer? You’ve got it. File System Access? Yes, please! Would love to make sure my web.config is correct. IIS / App Pool Info? Yep. You can even restart it. Running Services? All of them. Start and Stop them to your heart’s content. SQL Database access? You bet’cha. Alerts and Notification? Of course! You should know before your customers let you know. App and server diagnostics should be available when you need them. While we, as developers, try to plan for and think of everything ahead of time, there will come times where we need to get data that just isn’t available. And having to go through a lot of cumbersome steps to get that data, and then have to find a friendlier way to consume it…. well, that just doesn’t make a lot of sense to me. I’d rather spend my time writing and developing features and completing bug fixes for my applications, than to be writing code to monitor and diagnose.